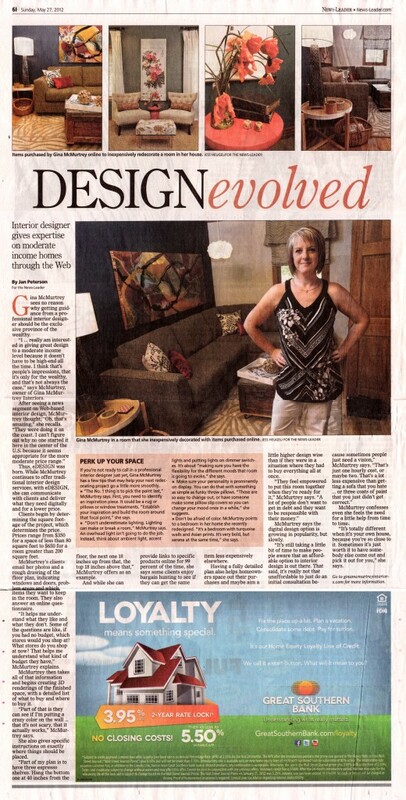 This weekend’s Springfield News-Leader features a great full-page article written by Jan Peterson on Gina McMurtrey Interiors and how interior design does not have to be just for wealthy clients. Through eDECORATING (referred to as eDESIGN in the article) — or through only an hour or two of design consultations — even homes with moderate incomes can benefit from having a well-thought-out plan in advance of tackling a design project. The full article is below, or you may view the online version of the story here. Also check out other articles featuring eDECORATING by Gina McMurtrey Interiors LLC at our new “In The News” page! For more information on eDECORATING or to schedule a consultation for your home redesign project, contact us today at either gina@ginamcmurtreyinteriors or by calling (417) 343-6058!